The Church of Jesus Christ of Latter-day Saints is distinct from other religions—even other Christian denominations—in a variety of ways. However, one of the core differences is its conviction that all people may have the light of Christ and receive a portion of the truth. Although Mormons claim to enjoy the fullness of the gospel as it was intended to be understood by God, we nevertheless do not deny that other religions, cultures, and individuals may have their own inspiration and knowledge to offer. There are many implications of this belief, but one of them is knowing that not one race, ethnicity, or culture is superior to another, for they all have value. In the Book of Mormon, Alma joyfully exclaimed that he wanted to spread the gospel around the world, noting that “the Lord doth grant unto all nations, of their own nation and tongue, to teach his word, yea, in wisdom, all that he seeth fit that they should have.” With the spirit of discernment, any disciple of Christ may see the light of truth in every culture and nation. Middle Eastern regions have served as the homes of many of the earliest known scripture stories, and, of course, Jewish culture was the first context for both Mosaic and Christian law. The current dispensation of the gospel was established in the United States, in which European culture has been dominant, although it has been strongly influenced by African, Latin American, and Asian cultures as well. Since then, the gospel has spread throughout the world and found a place within many nations that abide by a wide variety of customs. 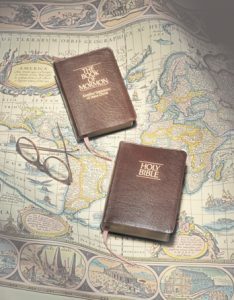 The Book of Mormon says that the full gospel has thrived in its fullness among Latin American and Native American people, and the book’s very existence suggests that the gospel may have been present in other ancient civilizations, too. In every religion and culture—many of which have influenced and been influenced by other religions and cultures—something of God’s truth may be found in a unique and instructive form. The diverse family of God. Courtesy of the LDS Media Library. Within such an intricate tapestry of races, ethnicities, and ways of life woven together, it’s remarkable and a testament to the veracity of the gospel that its simple, beautiful truths have resonated everywhere around the globe. It also points to the fact that, truly, no culture is superior to another, and all have equal value in the eyes of God. Consequently, the Church has urged its members to defy racism of all kinds and celebrate diversity. It has also denounced the racist actions of its past and recently encouraged members to welcome political refugees into their midst. 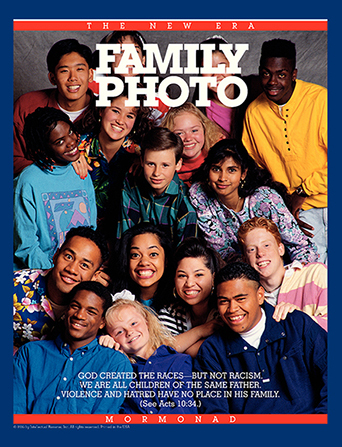 Despite this, minority Church members throughout predominantly white regions—especially the United States—have expressed frustration over feeling marginalized or even degraded within congregations where their perspectives are not understood or respected or where issues pertaining to their well-being are not addressed. These matters need not be political. Our baptismal covenants include comforting and supporting those who are in pain or enduring misfortunes, so when any members of our worldwide Church community are suffering physically, emotionally, mentally, or spiritually, it is our duty and privilege to offer them refuge in a Church whose doctrine teaches that they are loved as deeply as any other subgroup. When our fellow Church members are concerned—especially in large numbers—we are obliged to listen and heed, then make improvements where necessary. 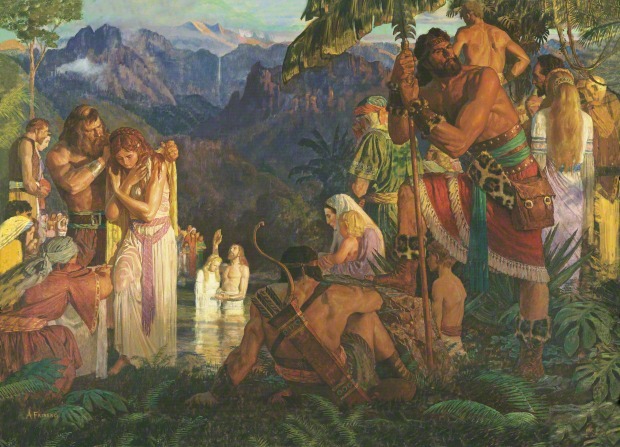 Alma Baptizes in the Waters of Mormon, by Arnold Friberg. Courtesy of the LDS Media Library. 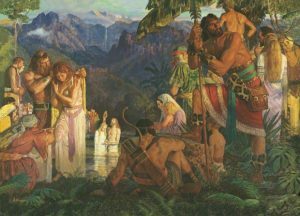 This illustration of the prophet Alma baptizing people in the waters of Mormon should serve as a reminder to all Latter-day Saints that we must keep the baptismal covenants that we made, which include supporting our minority brothers and sisters. God is a respecter of persons: Despite expecting Church members to be united in seeking to keep a certain moral standard consistent with Church doctrine, to believe that God values one culture over another is to perceive Him as a respecter of persons, which several prophets have insisted He is not. We are encouraged to follow our countries’ laws, love our ancestors, and have pride in our cultures, but we should do these things without trying to assert dominance or a sense of superiority over others. It is impossible to love the children of God as He has commanded if we seek to place them in a social caste, and it insults our Heavenly Father to demean anyone who was created in His own image. If God is not a respecter of persons, we should not be, either. Pride is morally permissible: Again, we can and should have pride in our cultures, but this is different from the sort of pride that destroys humility. Blindly seeing only the good aspects of your own culture, race, or ethnicity while degrading other cultures, races, and ethnicities indicates the type of pride that causes spiritual death, for it requires becoming “puffed up” and convinced of your own superior righteousness. It’s a condition that is not conducive to the Spirit, which Church doctrine dictates all members should possess in order to live according to God’s will. Stagnancy is consistent with life’s purpose: In a religion that teaches the virtues of continuously progressing and improving our surroundings—indeed, that our destiny is to become gods ourselves, inheriting the privilege of creating life, intelligence, and beauty throughout the universe—stagnancy has no place. Trying to force the Church to become homogeneous stunts the spiritual and intellectual growth of Church members, thus impeding our journeys toward godhood by dismissing other perspectives, customs, and experiences that could hold truth, beauty, and value that we would otherwise miss. Denial of prophetic counsel: Prophets are fallible, and all Church members are encouraged to seek personal confirmation of their teachings before following them. However, Church leadership—which is itself composed of diverse peoples around the world—have consistently held that all children of God are equal in His eyes. Priesthood and temple blessings are available to all worthy men and women, a clear denial of the notion that any group of humans is “less” than another. To ignore the teachings of prophets in this matter is to engage in “cafeteria-style obedience” and/or disrespect their authority. It requires assuming that you know better than those called to be God’s spokespeople, which can only lead to egregious distortion of doctrine and loss of the Spirit. It’s the very attitude that initiated the Great Apostasy following the ascension of Christ. Scriptures, by Grant Heaton. Courtesy of the LDS Media Library. All Church members are imperfect, but teaching these false doctrines could bring serious physical, emotional, mental, and spiritual harm upon minority members, not to mention they are extremely detrimental to the spiritual growth of their adherents, and they should thus be addressed with special urgency. Those who engage in spreading such false doctrines should repent immediately, for their own sakes and for the sakes of those who are affected by their words and actions. While they may not believe they are being hateful or acting contrary to the Spirit, all doctrinal evidence indicates otherwise. To continue in their ways is to risk destruction upon themselves and others. Here are some ideas for how to improve race relations with black members within the Church. Feel free to offer other suggestions for helping all minority races feel welcome in our congregations.